It’s no surprise that I love a good flower crown for dogs or people. Although they are a little more bohemian than my go-to style, if you’ve spent enough time on Pinterest in the last year, you can’t help but love them. A flower crown is the perfect feminine accessory for your dog! As you can see from these photos of my dogs Lucy and Lola, a DIY flower crown will take your photoshoots over the top (in the best way!). These floral toppers can also be used to celebrate your dog’s gotcha day, birthday or your own wedding. When I saw that a local florist was hosting a flower crown workshop I signed up tout suite! The class was hosted by Stephanie of The Blue Daisy Floral Designs. Stephanie gave a great tutorial and helped us all through the process. She also had a beautiful assortment of flowers and willow branches for us to use. (Scroll down for tips on how to make your own flower crown for dogs or yourself). I wore my completed crown out on the town right after the workshop. But naturally, I had more plans for my plants… and it involved the dogs! I returned to one of my favorite photo destinations (Mellon Park in Pittsburgh) and captured some gorgeous photos of Lola and Lucy. Lola really got to shine in this photoshoot since she can sit still for longer, while Lucy constantly tried to knock the crown off. I know there are tons of brides out there pinning this image to their boards, so go ahead and click the “Pin It” button and it to your own boards. Keep scrolling for the DIY tutorial and links to a few of my favorite ready made flower crowns for dogs. If you’re planning on having your dog at your wedding, listen to my podcast episode with wedding videogrpaher and dog mom Megan Sutherland who has some great tips! If you want to make your own flower crown, it’s fairly simple, but it takes time. Mine took about 90 minutes to make! You need floral wire and lots of floral tape (I recommend this wire and this tape). Wrap a length of wire (long enough to fit around your head or your dog’s head) with floral tape. Cover it! Then make a whole bunch of tiny little bunch of flowers. Each of mine had 3 different flowers or branches. I used about 15 little bunches to create my crown. Once you have all of the little bunches made, you attach them one at a time to the taped wire with more floral tape. You want to start at the top and work your way down so each bunch overlaps the one before. This way you won’t have gaps that show them the crown is rounded and placed on your head. Tips: You can be as complicated or a simple as you want, but keep in mind that the more flowers you have the heavier it will be. I made my crown with fresh flowers, but if you use faux then this will last for years of doggy photoshoots! Order a mix of flowers for the best results. Here’s some cool lavender, succulents and peonies that would all be great in a flower crown! Once you have a fabulous flower crown ready, you’ll want to throw a puppy party with some delicious pupcakes for your friends. Maybe you’re not feeling crafty? That’s OK! There are tons of talented dog moms out there who’ve already done the hard work for you. I handpicked my favorite flower crown makers on Etsy who will get your all set up for your big day – these ladies specifically make flower crowns for dogs! Flowers and Frosting makes this crown that’s super similar to the one I made! Pulelehua Designs will custom make you a Hawaiian inspired flower crown to fit your colors and vibe. If you think twinning is winning, then you’ll want to check out Ellis Originals who has a Mommy/Doggie matching flower crown or collar set! Love this DIY? I have so many more ideas for projects you can do with your dog. Access them all in my Recipe and DIY Library. Just click the link below and you’ll get the secret code to get in! Stunning! Snazzy! Brilliant on every level! They are gorgeous! Love the colorful crowns! Are you kidding me? 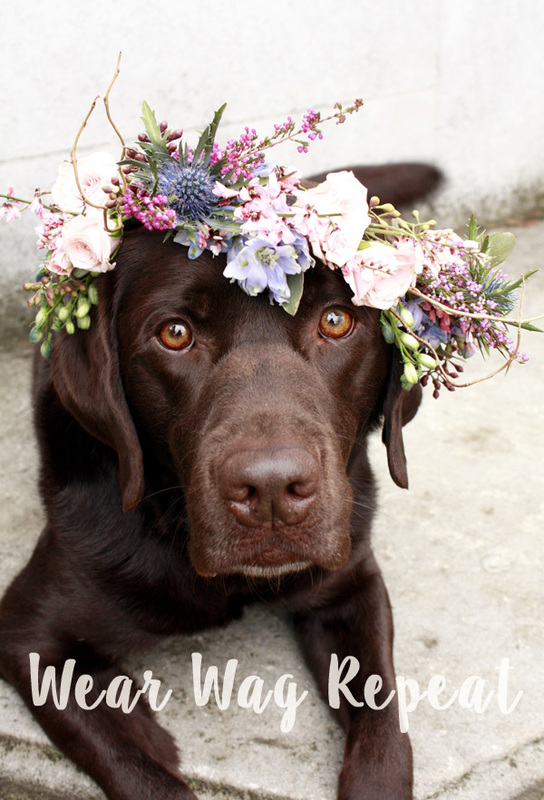 I can’t stand how cute your dog is patiently and happily wearing the flower crown! It’s beautiful. The only thing my dog will let us put on him is his shock collar. If he runs outside without it, we yell “you need your necklace” and he stops and comes back and sits so we can put it on him. He knows it’s a necessary piece of outerwear, he’s such a funny Golden. Aw, so cute! Retrievers are so goofy! Your dogs are so cute OMG. I’m learning how to paint and I would love to paint them if you allow me to use their pics, I would really appreciate it! omg just LOVE this and now I want to make some for the girls! You should do it! Their heads are little, so you could end up wearing them as bracelets when you’re done taking photos! I cannot get over how gorgeous these photos are! Precious fur baby in a floral crown…LOVE! You can totally make it for yourself instead! Thats what I did, but I couldn’t resist getting dog photos with it too! Nice to see you at the Pet Parade. Very pretty! I think my human needs to make one for Bessie, my Basset Hound minion. Hi to you, Lola & Lucy! Mew Mew! You, you definitely need one! And Spring is the perfect time to do it, there are so many flowers! If you post a photo of the finished product on Instagram please tag me @tmistick so I can see it! Those crowns are so pretty! I may have to try making one someday! You should definitely make one! They are great for a photo op! Thank you so much! I made it in a workshop at a local florist, so I’m not exactly sure what everything is. I do know the blue spikey thing is thistle because it’s one of my faves! There are also some kind of little roses and flowering branches. If you show it to a florist they will know! Hi, would it be possible to get some of your in images in hi res? Hi Karlin – I’m happy to license my images out to the right projects. Please shoot me an email tori [at] wearwagrepeat.com. Thanks!